West Edge Opera presented its second set of Snapshots in its new series of selections of opera composed by Bay Area librettists and composers. Saturday’s performance at the David Brower Center was just as diverse as the last month’s selection. The instrumentalists just as accomplished and the singers just as vibrant and theatrically engaging. Music Directors Mary Chun and Jonathan Khuner shared conducting of the nine-member band composed of instrumentalists from Earplay, the justly admired new music ensemble that is based in San Francisco. The four selections chosen by curator Brian Rosen and West Edge Artistic Director Mark Streshinsky included works by Carla Lucero, Allen Shearer and Claudia Stevens, Linda Bouchard and Liam Wade. Lucero’s Touch opened the program with the scene called “One O’Clock.” The opera is about Helen Keller, specifically her love for Peter Fagan. In this scene, Fagan comes to pay court to Keller, but her teacher and companion, Anne Sullivan, sees his affections as taking advantage of the young woman. In her pre-performance talk, Lucero told of how she was drawn to Keller by the idea of how she must have “heard” sound. Within the opera there are two sounds worlds. Those who can hear live in a world of sound portrayed by the composer through consonant music. She portrays Keller, who cannot hear or see, through a dissonant sound world composed of only four notes D, E, A and F. And there was a complex ongoing interaction between these two musical approaches throughout this moving scene. Librettist Clauda Stevens bases her text on the British novelist E.M. Forster’s Howard’s End. But rather than set the opera in England, Stevens opts for an American version of this classic novel on middle-class hypocrisy and repectability, setting the story in Boston during the 1950s. Highly compressed, the scene presented shows the birth of the illegitimate child of Leonard Bast, in this case an African-American Beat poet, and Helen Schlegel, one of the kind-hearted sisters who stand for human connection. In this wrenching scene the birth is musically interpreted by the vocalese of soprano Amy Foote as Helen, accompanied by shrill notes on the clarinet rising and falling to represent the waves of pain felt in child birth. The character of Leonard Bast allowed composer Allen Shearer to add jazz and saxophone into the lushly scored music. The second half of the program brought a party in the form of Linda Bouchard’s percussion-driven setting of poems by the wonderful Uruguayan writer/ artist Eduardo Galeano. Even the flutist was seen banging on a drum in this selection from The Book of Words. Tenor Joe Meyers gave his all as the Man from Negua, known to us more familiarly as God. Meyers agonizes over his creations, who when he says “flight” hear “fallen.” Nonetheless, he loves these perverse little creatures. “Who could imagine that mud could be so luminous?” Daniel Cilli and Julia Hathaway sung the deluded first couple. And Jonathan Khuner and Molly Mahoney put in bilingual time adding the original Spanish to the acoustic mix. Both the party and Joe Meyers got wilder in the closing selection, The Stranger the Better by Liam Wade. Based on Tennessee Williams’ Streetcar Named Desire and with a libretto by Vynnie Meli, the opera was first drafted in the Atlanta Opera’s 24-hour Opera Program. In a single day, Wade and Meli put Streetcar on a different track. The opera opens with a Voodoo priestess sung by mezzo Molly Mahoney, the accompaniment augmented by a strummed washboard. Daniel Cilli yells out Stella, Amy Foote sashays delicately among the notes, and Joe Meyers is a Blanche to end all Blanches. With torn T-shirt and a red wig, life in The Big Easy takes fun to the max. Snapshots from West Edge Opera is slated to appear again next year. Keep your eyes and ears open! 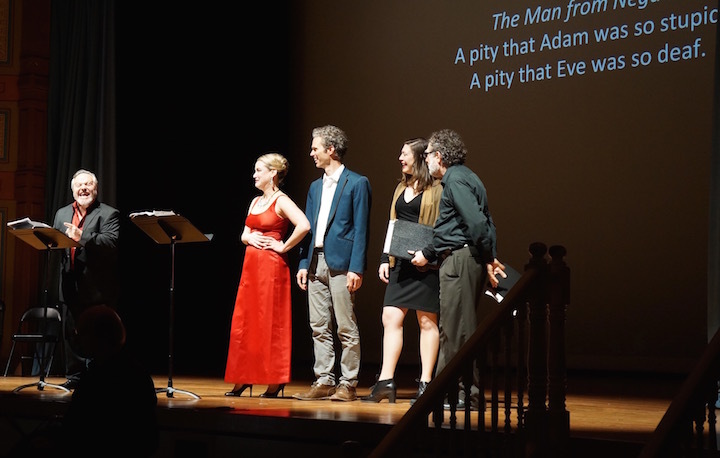 Photo: Left to right, The Man from Negua (Joe Meyers) complains about Adam and Eve to Julia Hathaway, Daniel Cilli, Molly Mahoney, and West Edge Music Director Jonathan Khuner in West Edge Opera’s Snapshot production of Linda Bouchard’s The House of Words. Photo provided by West Edge Opera.